Free London daily rag the Metro recently caught up with Akala, Ms Dynamite’s sibling. I only know Roll Wid Us, which is a few years old now, from this guy. The Dexplicit remix of that was cool. "'We spend our lives being put in boxes; it’s the boxes I can’t stand, man.’ It doesn’t take much to get British hip hop wordsmith Akala (aka 26-year-old Kingslee James Daley) on a roll, as we chat over a healthy pick’*’mix from his favourite veggie restaurant. This amiable rabble-rouser has always looked to break the mould, combining sharp lyrics with cherry-picked pop culture hooks, from 1980s indie to electro-trance. ‘The funny thing is, this approach isn’t new for hip hop,’ he points out. ‘The musical philosophy of my latest album was Aphex Twin meets Public Enemy meets Depeche Mode with a bit of Radiohead sprinkled in – then there’s the heavy metal stuff, which fazes some people. Along with several quickfire mixtapes, Akala’s acclaimed previous albums, Mobo-winning 2006 debut It’s Not A Rumour and 2007’s Freedom Lasso, continue to sell steadily, and also gave rise to the fruitful Hip Hop Shakespeare Company (he’s just returned from a youth writing workshop in Denmark). The literary inspiration for new album Doublethink is George Orwell’s dystopian novel 1984. It’s not the first time Orwell’s classic has influenced records – David Bowie used it as the basis of his 1974 album Diamond Dogs; The Eurythmics released a synth soundtrack in the year 1984. But Akala’s apocalyptic vision is galvanising and beautifully arranged on numbers such as Welcome To Dystopia and Yours And My Children. Doublethink is a remarkably uplifting listen, given that it’s about dystopia. ‘Well, we have some issues – but we can’t solve them by being miserable,’ he quips. Lead single XXL has already sealed its place as a storming club hit (‘funky as hell’, indeed), and that’s part of what makes Akala a unique star; he’s possessed of freestyle prowess and a natural self-confidence that’s lacking in most bling-flaunting big-hitters – he’s a hip, lucid commentator who can actually fire up a party. Akala is by no means a loner, though, admitting that ‘there are hundreds of artists I feel an affinity with’; he even blushes when he gushes about his love of Radiohead. He’s not about to categorise his listeners, either, although he glows with pride when mentioning some feedback (‘I got a message about a guy who’d decided to stay in school because of a line in my track Roll Wid Us where I was boasting about my GCSEs’). 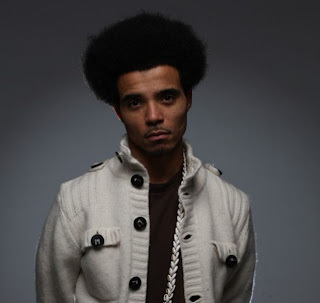 In Orwell’s 1984, a Party slogan is: ‘Who controls the past controls the future: who controls the present controls the past.’ With Doublethink, Akala is a musical talent of his time – and he’s just ahead of it, too. Doublethink (Illa State) is out on May 3."